Surrey RFU schedules a post-Christmas cup competition with four groups leading to a Finals Day at Esher for the best ranked teams. After much shenanigans, the Finals Day format was settled as two 20 minute each way Semis, followed by Final and Bronze matches. 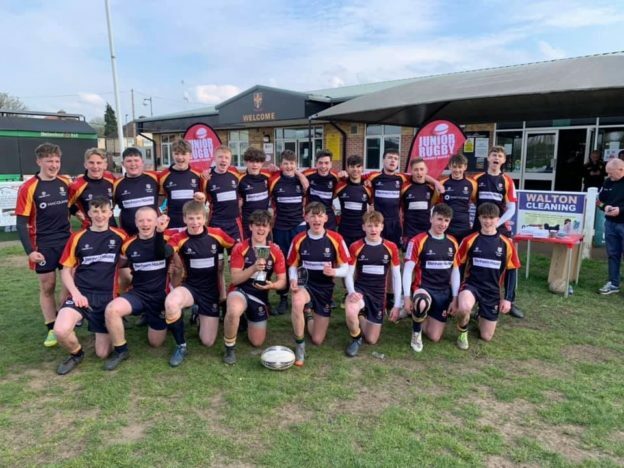 Chob found themselves as top seeds by dint of 3 bonus point group fixtures giving them a Semi-Final against Old Wimbledonians, the other match being Effingham v Reeds. 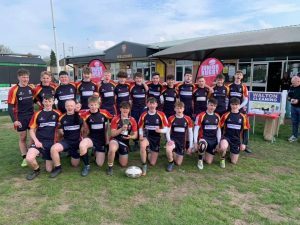 OW and Effingham had played out a 12-12 draw in the main Waterfall Cup final the previous week so it was clear it would be a tough day at the office for the boys. Rarely, there was no previous fixture against OW so this was breaking new ground. The scale of thee challenge came clear very quickly as OW scored from the first kick-off. They worked their big hitters in midfield to drive back the defence before creating a gap out wide. 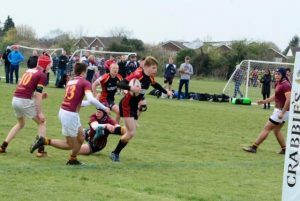 The first tackle was made but good support allowed a score under the posts and an immediate 7-0 lead. Things didn’t immediately improve with the restart going straight out and OW getting a scrum on halfway. OW continued to work the fringes and Chob conceded a penalty which OW duly kicked into the Chob 25. Chob’ pressure breaking quickly led to Gideon poaching another interception and haring off up field. He was finally into touch 10 yards short. OW made a mess of the line and Dan dived to pouch the loose ball. Chob then showed composure at the ruck to recycle before Al drilled over and Gideon levelled at 7-7. OW were unphased and kept the pressure on. From a Chob line they managed to hack down field to the Chob 25. They attacked hard in midfield from a scrum and managed to cross near the posts to open up a 7 point lead again. In the run up to half-time Chob had steadied and driven into the OW 25. A throw to the second pod and forward drive got close before the backs opened up with Jack getting to within a couple of yards. OW had conceded a penalty and quick thinking put Chris through a half gap to level things at 14-14 at half-time. The second half became very much an arm wrestle. OW certainly shaded the possession, but the Chob defence was immaculate to keep them at bay. OW had one phase near the Chob line after Chob had initially stolen a lineout, the blue line stretched but didn’t break and they forced OW back to the s25 yard line. It seemed that the game would go the way of OW, as they had scored first. Chob managed to win two penalties in quick succession to reach midfield. OW were clearly nervous too as they knocked on to give Chob a scrum with a couple of minutes left. Gideon once again darted through a gap and Adam was right with him. The pack piled in behind and got to within 5 yards. The move broke down but Chob had a pen advantage from a ruck. All on the touchline were yelling for a kick at goal but the boys were obviously in control and didn’t need any help. Gideon slotted the kick and Chob were ahead for the first time with no more than a minute to play. A good high restart was in blue hands and it became like a match on TV. A couple of hit ups from the forwards kept hold and with the ref verbally counting the seconds down the final phase was safely negotiated and a punt into the next field confirmed Chobham as finalists by an extremely narrow margin. 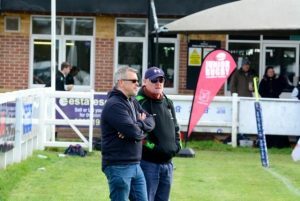 News from the adjacent pitch came through that Reeds had also squeaked through scoring the only points with a try in the last minute so it would be Reeds against Chobham in the final on the main pitch. To the final then, and an opportunity to avenge the single point defeat at Whiteley Village earlier this season. To say that put in their most mature performance would be an understatement. Reeds kicked off and ended with a lineout on the Chobham 10 yard line. Chobham were in their faces from the get go, with Fin closing down everything from the back of the line. This was Reeds only trip into Chobham territory for 20 minutes as they were smothered every time they managed to win some possession. First up tackling in the backline snuffed out any chance of a break whilst the forwards knocked back everything around the fringes with Al’s red scrum hat at the forefront of the defensive effort. Gideon went down to a nasty ankle injury at the midway point of the first half. 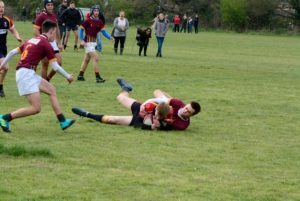 After trying valiantly to continue he had to concede defeat and Harry stepped in at scrum-half from the wing. Chobham finished the first period camped in the Reeds 25. The pack ground down to the 5 yard line drawing a penalty. A quick tap almost made it but play was halted for a head injury. From the resulting scrum the pack once more went to work. They were a couple of feet short when Al gave it the ‘eagle eyes Action Man’ look and spotted the smallest of gaps to reach the line for his second of the day and establish a 5 point lead on the whistle. The second half continued in similar style to the first. Reeds were restricted to their own half as the defensive shift across the park showed no sign of easing. Reeds tried to work their big 13 into gaps but he was gang tackled every time and had no option to offload. The Reeds scrum was under pressure and rushed hands ended with a Reeds head nodding the ball into George’s hands. As the defence had to turn and scramble Chobham were awarded a penalty. 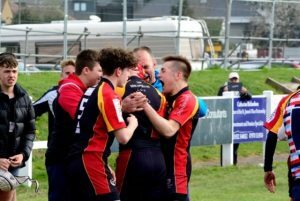 It was George who stepped up this time to extend the lead to 8 points meaning Reeds needed two scores to win. The fans were now checking their watches every few seconds as Reeds tried to get back in the game. Chob were content to keep things tight as the forwards discipline at the ruck burned down the clock. With a couple of minutes injury time played Reeds had a line on halfway. They won another penalty and Chob were taken 10 yards back for clinging on after the whistle. The Reeds line was messy and a Chobham foot punted the ball into touch, the referee blowing for the end of the match. 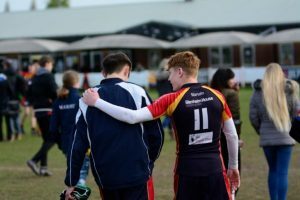 A superb effort by the whole squad who had probably gone into the semi-finals as outsiders but had dug deep and scrapped to a fine victory, to the delight of the coaches and head of Surrey Youth Rugby. Squad: Adam, MaxM, Dan, Andy, Doug, Callum, MaxA, Matty, Adam, Saxon, Harrison, Ben, Gideon Aran, Fin, Chris, Charlie, Jack, Harry, George Rhys, Billy, Connor.